Nope! Can’t buy our way into heaven, that’s for sure. It is only by God’s grace that we are saved. Blessings, Frank! Thanks for the kind comment, Martha. If the essay wasn’t in danger of running long, I would have added that it’s also NOT possible to barter your way into Heaven. In other words, whatever good deeds we’ve done can’t count towards cancelling out the bad things we’ve done and the good things we’ve failed to do. Going to Heaven is never a negotiated thing. I find it odd that you’d single out a churchgoing Catholic and claim he doesn’t believe in God. 1. 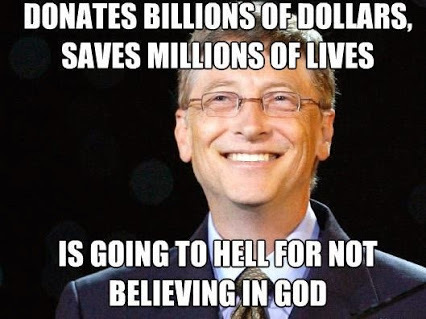 David, as I mentioned in the essay, I researched what Bill Gates said about faith in several interviews. That is the basis for my assessment. 2. I called Bill an agnostic. That’s different from an atheist. 3. The initial singling out was done by members of an atheist Internet community. They created the meme/graphic that inspired this essay. Not a clear affirmation of belief, but not enough for me to be willing to label him an agnostic. You’ve probably read more interviews of him than I, and came to a different conclusion, that’s fine. Yet, while your essay is more nuanced, you chose to illustrate it with an image that’s anything but nuanced, which appears to judge him an unbeliever destined for Hell. When we get right down to it, how can any human being truly know anybody else’s beliefs? Much less be in a position to judge them? I find it hard enough to know and evaluate my own beliefs. Every individual’s beliefs seem to differ, a lot or a little, from every other individual’s beliefs. So, if beliefs are required, I hope God has a notion of “close enough”; that seems to be part of what grace is. Who are we to say whether or not someone else is close enough? For some reason, I didn’t see point 3 when I made my reply. Out of context, it’s hard to tell the source of the image, but I hope you are aware that there are some Protestants who seem to consider Catholics to be godless non-believers. (eg. Jack Chick is one of the more blatant ones pushing that viewpoint). I apologize, I was feeling poorly last night, and I need to watch what I say more closely when I feel poorly. My tone was bad, some of the “facts” were stretched beyond recognition, and I managed to get judgmental while speaking against judgmentalism. One can argue that someone like Bill, who is not sure that believing in God would change his actions and who continues to act so generously and compassionately, is more kind and deserving than someone who only acts kindly because he or she is afraid of being punished for not doing so. Some of the kindest people are not acting out of fear, but some of the most violent acts in history have been committed for religious purposes. Belief in God does not override cruelty and a wavering belief doesn’t justify one going to Hell in my view. Jesus died for our sins and if going to heaven is a given, then we don’t have to earn it. The Bible is full of contradictions and makes it difficult to read. Faith is difficult for man. God knows that. He says “Forgive seventy times seven.” Those who look into their hearts and follow the good intentions should be rewarded and forgiven by God, who preaches forgiveness. Sandie, you are not alone in believing the Bible is “full of contradictions”. Let me gently ask you: does this viewpoint come from your reading of the Bible? Or has it come from hearing and accepting the opinion of others who have made this declaration? There are all kinds of books and websites (especially http://www.CARM.org, http://www.ReasonableFaith.org and http://www.rzim.org) that carefully, fully examine and explain ALL the supposed contradictions. Because I believe it’s important to be sure of your viewpoint, I urge you to take the time to visit them and ask questions.